Image caption The Flintstones followed the fortunes of a "modern stone age family"
Cartoon classic The Flintstones is set to return in a new version devised by Family Guy creator Seth MacFarlane, Fox Television has confirmed. The new series, likely to air in 2013, will give a "21st Century spin" to the 1960s Hanna-Barbera animated series. The popular show followed the fortunes of Fred Flintstone, his wife Wilma and their neighbours Barney and Betty. "The very first cartoon character I drew at age two was Fred Flintstone," said MacFarlane in a statement. "So it's appropriate that events have come full circle, allowing me to produce the newest incarnation of this great franchise." According to Fox entertainment president Kevin Reilly, it is hoped the new series - to begin production later this year - will introduce the prehistoric characters to a "whole new generation." "Fox has long been home to iconic families like the Simpsons and the Griffins, so I have no doubt that the Flintstones and the Rubbles are going to fit right in," he said. MacFarlane, 37, is best known for Family Guy, which centres on the dysfunctional family of bumbling patriarch Peter Griffin. 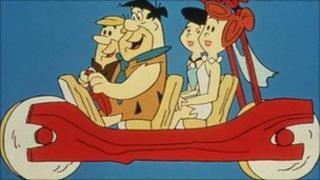 The Flintstones first appeared on US television in the 1960s, going on to inspire three Hollywood films. The new show will be a co-production between 20th Century Fox Television and Warners Bros Television, owners of the Hanna-Barbera stable of animated properties. Other new programmes announced by Fox this week include Touch, a drama about a father-to-be played by Keifer Sutherland of 24 fame - with special mental abilities. The network has also plans to make a cartoon version of cult comedy Napoleon Dynamite and a show about ghosts on Alcatraz - the brainchild of Lost and Alias creator JJ Abrams.